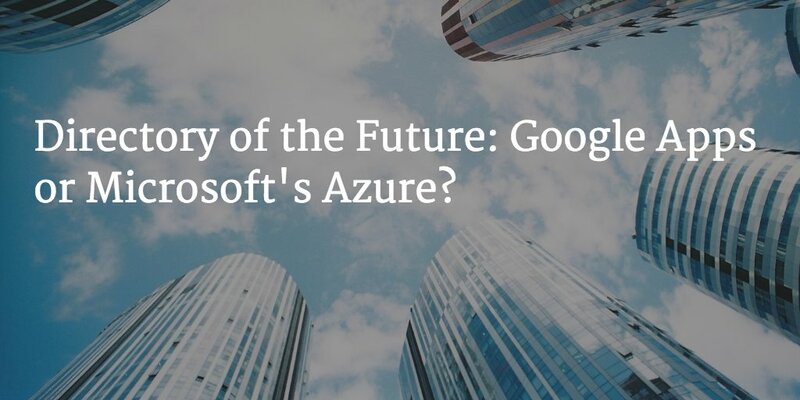 Directory of the Future: Google Apps or Microsoft’s Azure? Home » Blog » Directory of the Future: Google Apps or Microsoft’s Azure? There is going to be an epic technology battle fought around cloud productivity platforms. It is already underway between Google and Microsoft, but will start to intensify with the battle for the cloud-based directory services space. Google fired the first salvo when they introduced their Google Apps platform which was focused on replacing Microsoft Exchange and Office. Over the last few years, Google’s entrant has garnered massive market share with over six million organizations and sixty million users. It’s been an impressive run. Microsoft is fighting back with its Office 365 implementation. Exchange, Outlook, and Office are all being migrated to be cloud-based services with a similar business model to Google’s simple per user per month pricing. Microsoft has recently stemmed their defections and is now starting to take market share away from Google. It’s a battle that will have far, wide-ranging consequences. Recently, the two have started to introduce the concept of cloud-based directory services. While Google’s directory has largely remained a contact database and an authentication point for Google applications and some select third-party web applications, it has shied away from the concept of being the overall directory for an organization. In fact, Google has built connectors to on-premises directories such as Active Directory and OpenLDAP. Microsoft, on the other hand, is starting to build a cloud-based version of its on-premises Active Directory solution. While Azure AD is still far away from that goal, it has been adding more capabilities. Unfortunately, both solutions come up short of the vision of being a central, authoritative user store for an organization. The decision then must extend to include other factors like what cloud productivity solutions can be helpful to an organization and if Google Apps is better than O365. Still, IT admins remain interested in finding a cloud-based directory service that can connect all of their users to the IT resources they need without any on-premises hardware or software. A vendor-agnostic platform is focused on solving this problem. Directory-as-a-Service is a new, innovative cloud-based identity management platform that securely connects users to devices (Macs, Linux, and Windows), Infrastructure-as-a-Service providers (AWS, Azure, and Google Compute Engine among others), applications (cloud or on-premises), and WiFi networks. It is a complete, central solution to integrate all of an organization’s users with whatever IT resources they need. IT gains control, and users have one set of credentials with which to access all of their resources. If you would like to learn more about how this cloud-based directory services battle is shaking out, drop us a note. We’d be happy to help explain the pros and cons of each platform.